I made a very nice trip to Lasnamäe again in that day. It was just wonderful. I wanted to visit those red higher blocks and the new bridge. I wanted to say hello to these atypical red blocks (or bricks to be precise). I had noticed them briefly before and I couldn't wait longer. 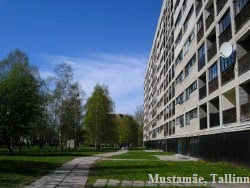 And this one is also a miracle because it's a building of Mustamäe, not Lasnamäe. As far as I know it is the only building of Lasnamäe that has escaped from Mustamäe for some reason. It's exactly the same as the longest building in Mustamäe (at least of this type). That's the other side of this building. You can see this a lot in Mustamäe. Like robots in a row, shoulders visible. One of my favourites in Lasnamäe. Actually, this one is also similart to typical Mustamäe block. Now I moved to another area, I think it's called Pae (and there's a street with this name, these buildings have the address of Pae street). That's what they were before renovation. This should be Smuuli street, heading towards the new bridge.